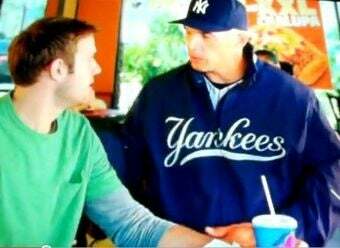 I've been obsessed with this XXL Chalupa, getting a lot of airplay in Taco Bell ads during the playoffs. But it looks like it would decompose about as naturally as a Happy Meal. Especially with that nuclear orange cheese sauce. So today I had a great idea. I would make my own. I'd do it healthier, too. I'd buy lean ground beef, lite sour cream and cheese, go easy on the sodium, make sure to use freshly chopped tomatoes, onions and lettuce. I brought all that crap home and realized the true lure of fast food. It's not that it's fast. It's that someone makes it for you. The University of Mississippi - you might recall they once considered Admiral Ackbar for their new mascot - has gone with something more cuddly. A black bear - from rival Louisiana. Apparently Western Michigan U. regularly postpones classes due to zombie outbreak. Visit the page and then hit Z and V simultaneously. A Pennsylvania woman ate a poppy seed bagel the day before she gave birth. That was enough to generate a false positive for opiates in her bloodwork. And that was enough to get child protective services to take her kid away. You better believe there's a lawsuit coming.